ePublishing Knowledge BaseePublishing Knowledge BaseePublishing Knowledge Base Creating and Sending eNewslettersHow do I send a welcome email to new registrants? 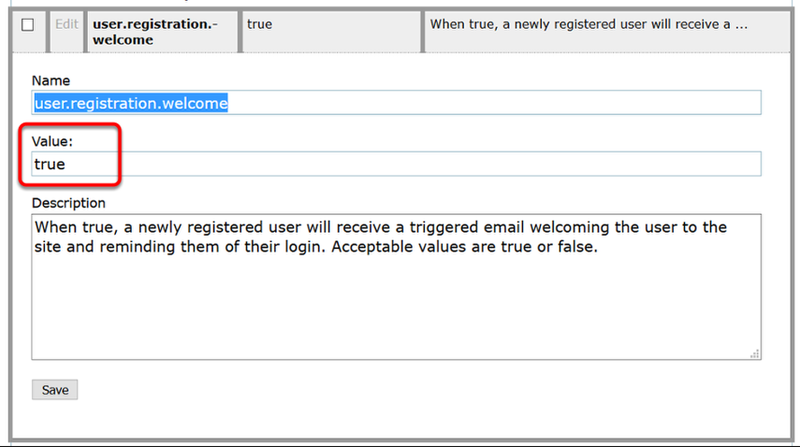 When a visitor registers or subscribes on your site, a welcome email may be sent automatically when you turn on the relevant settings in Sys Admin. This article will show you how to create and modify your welcome message. 1. 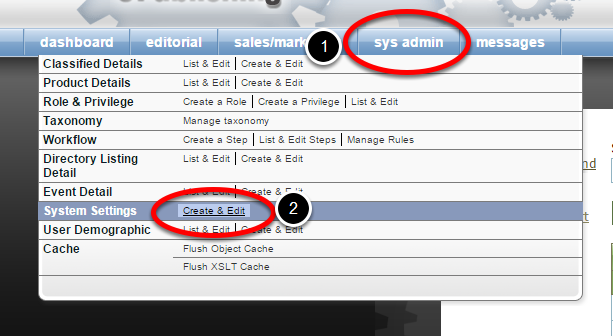 To get started, access the Sys Admin menu in your ePublishing tools dashboard. 1.1. Scroll down and select Edit next to user.registration.welcome. Make sure the setting is set at "true." 1.2. 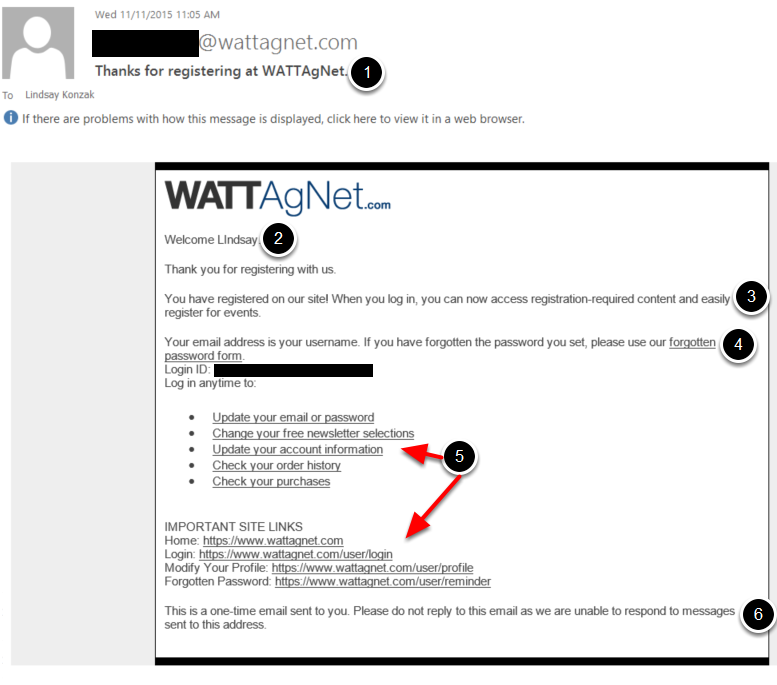 Update the Value to true if you want registered users to receive an email. Set it at false if you don't. 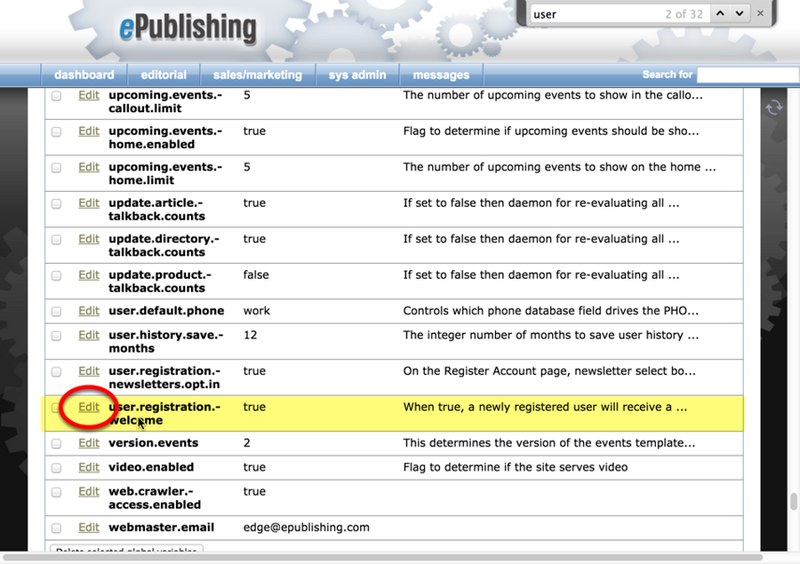 Zoom: Update the Value to true if you want registered users to receive an email. Set it at false if you don't. 2. 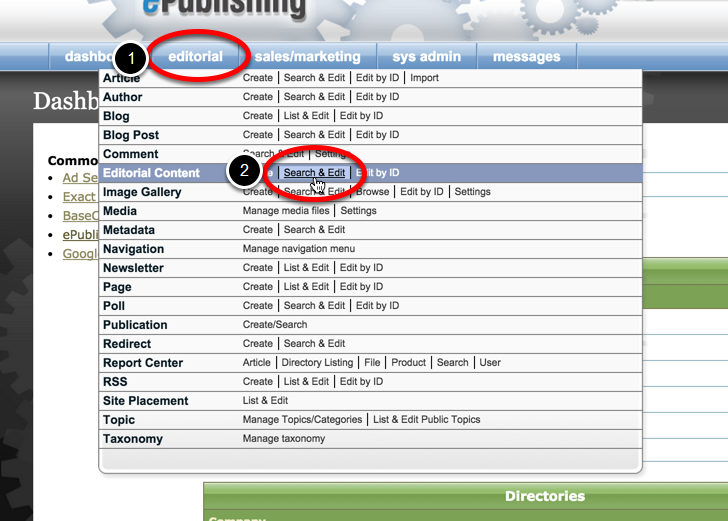 To edit your welcome email, select Search & Edit next to Editorial Content under Editorial on your dashboard. 2.1. Do a search for the word "welcome" under Internal Name in the Editorial Content Manager; click Search. 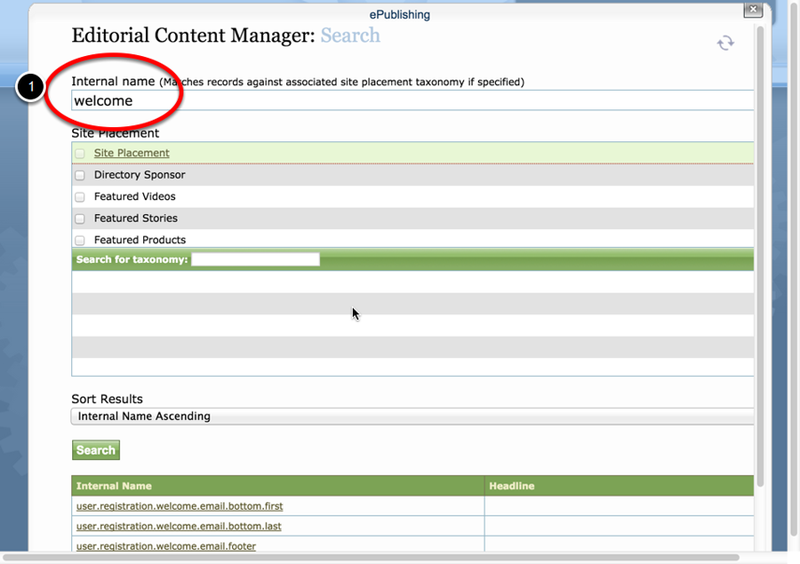 Zoom: Do a search for the word &quot;welcome&quot; under Internal Name in the Editorial Content Manager; click Search. 2.2. Select the area you would like to edit. Zoom: Select the area you would like to edit. 2.4. After selecting the area to edit, you will be taken to the Editorial Content Manager. Do not change the Internal Name. 2.5. 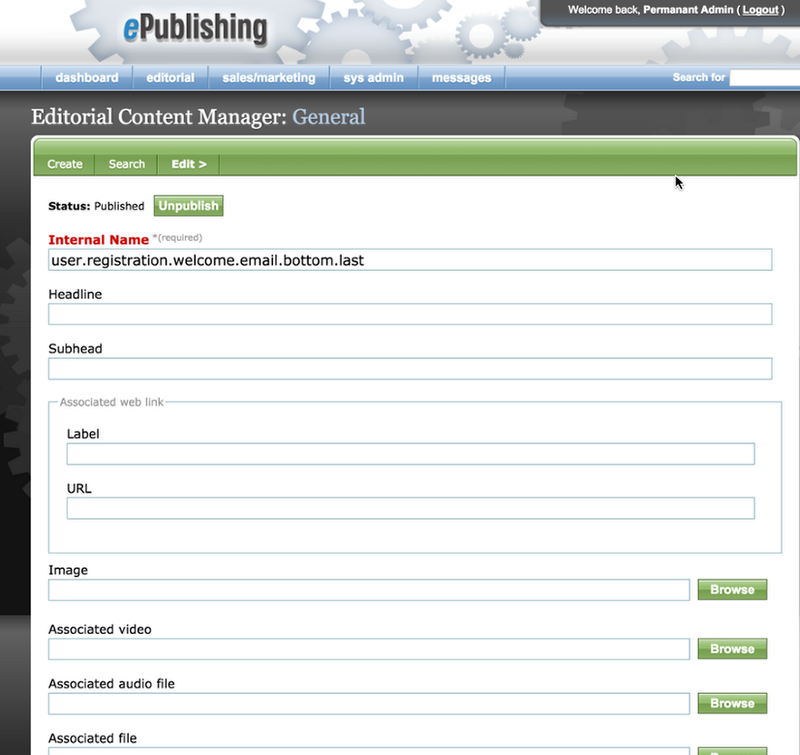 Edit the text in the Body of the Editorial Content Area. Scroll down and click Save. Use the WYSIWYG editor or paste HTML directly into the box. 2.6. Click Search at the top of the page to select and edit other parts of your Welcome Email. 3. Contact your Solutions Manager if you have any questions. Next: How can I send a newsletter by copying and pasting to my Email Service Provider?